Diners at THE MED enjoy flavorful New American cuisine and a great ocean view. 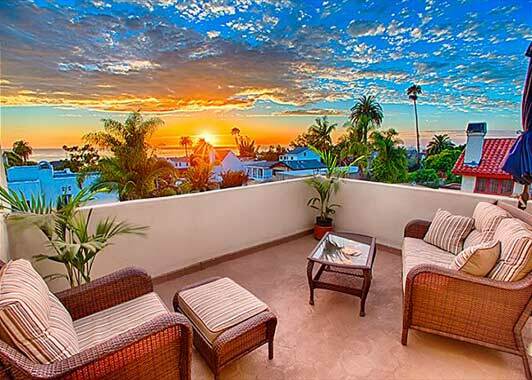 Win Getaway and enjoy the best of beautiful La Jolla. La Jolla, California – San Diego’s favorite coastal community – is a haven for foodies. Here’s your chance to dine in La Jolla’s best restaurants, sip great California wines, and sample some San Diego craft beer (without ever pulling out your wallet). The winners will also be treated to a scenic helicopter flight along the San Diego coast and have plenty of time (between the great dining experiences) for walking on the beach, kayaking, shopping, soaking up the scenery and watching the sun set over the Pacific. Lodging will be in a one- or two-bedroom coastal vacation rental home, which could include an ocean view, swimming pool, or hot tub. Most of these are pet-friendly. Enjoy The Artisan Table experience at A. R. Valentien, the signature restaurant at the Lodge at Torrey Pines overlooking the renowned Torrey Pines Golf Course. Also savor the flavors of Chef Daniel Barron’s New American cuisine at THE MED at La Valencia, La Jolla’s beautiful pink Spanish-style hotel (with an amazing ocean view). Be the guest of award-winning Karl Strauss Brewing Company for a craft beer tasting, brewery tour and lunch or dinner for two. Winners will also feast on San Diego’s favorite tacos, take part in cooking classes or shop at Sur La Table, and have a chance to “talk food” with award-winning chefs. in a one- or two-bedroom SeaBreeze vacation rental home in La Jolla. Enter the capcha code as requested by FeedBurner. Important: activate your subscription by clicking on the link in the email you will receive from the site. In order to enter, your subscription must be active. If you could dine anywhere in La Jolla, where would it be? What is your favorite restaurant (anywhere in the world)? CAN’T FIND A PLACE TO LEAVE THE NAME OF YOUR FAVORITE RESTAURANT? SCREEN DOWN THROUGH THE COMMENTS OTHERS HAVE LEFT UNTIL YOU COME TO A BLANK FORM THAT SAYS “LEAVE A REPLY” – AND THEN WRITE THE NAME OF THE RESTAURANT AND CLICK “SUBMIT COMMENT.” THANK YOU FOR YOUR PATIENCE. Your dining tip will be helpful to other travelers, but won’t impact your chance of winning this contest. The winner will be chosen in a random drawing. 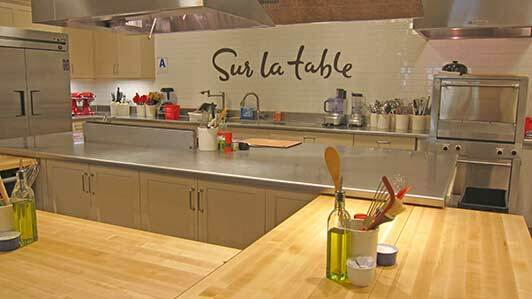 The communal Artisan Table at A. R. Valentien takes place on Thursday night. Two people for three nights in a one- or two-bedroom Sea Breeze Vacation Rental house ($900 value). Optional extra nights at 50% discount. Guests will receive a SeaBreeze VIP card for discounts on fun stuff around town – including snorkel, kayak or bike adventures. Most properties are pet friendly. Depending on availability, rental house may include ocean view, hot tub and/or swimming pool. A 45-minute scenic flight along the La Jolla coast with Icon Helicopters ($550 value). Cooking classes or shopping at Sur La Table La Jolla (two $79 gift cards, redeemable for one class for two people or two classes for one person). Gift cards can also be used for shopping online or shopping at any Sur La Table store. Dinner for two at THE MED at La Valencia Hotel ($100 gift card). Enjoy Chef Daniel Barron’s great food and a beautiful ocean view. Dinner for two at The Artisan Table at A. R. Valentien, The Lodge at Torrey Pines. (Valid on Thursdays.) 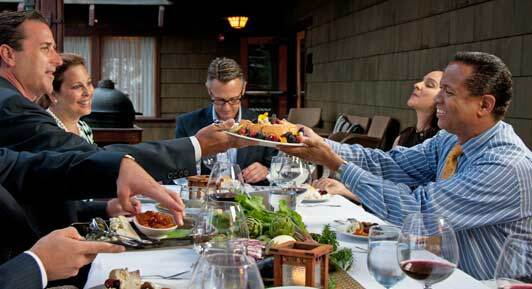 Chat with chef and sommelier, as well as kindred spirits, over platters of superb farm-to-table food ($170 value). A meal (lunch or dinner) at Rubio’s in La Jolla (famous fish tacos, $35 gift card). Craft beer tasting, brewery tour and lunch or dinner for two at award-winning Karl Strauss Brewing Company in La Jolla ($50 gift card). 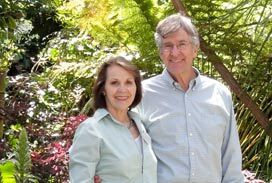 One hour of personalized trip planning by Elizabeth Hansen – to ensure that your time in La Jolla will go smoothly ($75 value). An autographed copy of Food Lovers’ Guide to San Diego by Maria Montana. This is the best guide to San Diego’s food, wine, and beer scene. The winner of the Delicious La Jolla Foodie Getaway has the option of enjoying the trip or transferring the prize. Wouldn’t this make a wonderful gift for someone special? 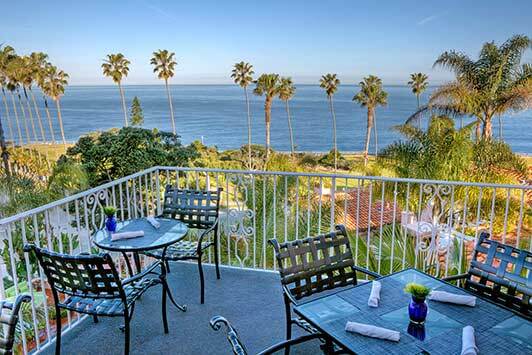 The Delicious La Jolla Foodie Getaway excludes airfare and ground transportation. Lodging, meals, the helicopter flight and cooking classes are subject to availability. The Karl Strauss gift card cannot be used for brewery tours Friday and Saturday 5-8pm. Artisan Table dining at A. R. Valentien is only possible on Thursday night and no substitution is available. The drawing will take place on December 17, 2013 and announced the following day. Entries must be submitted before midnight (Pacific Standard Time) December 16, 2013. Participants must be 21 years of age or older residing within or outside of the United States. Winner will be drawn at random by computer and notified by the email you used to subscribe to this website. Only one entry per person please (leave only one comment below). Fish Tacos from Rubio’s, Beer Sampler from Karl Strauss. What an Amazing giveaway!!! Although, your question is quite difficult to answer as there are SO many fabulous spots to dine in La Jolla, it’s not easy choosing just one! 🙂 Narrowing it down, I would have to go with George’s At The Cove. They have spectacular food and drinks and a dining view that is to die for. Another favorite spot is Truluck’s! Talk about a culinary experience that you will never forget! The seafood is scrumptious and the staff truly makes you feel like royalty. I love La Jolla! The shopping, beaches and best of all the amazing cuisine! I am not sure…is this how I enter????? Yes, Lorita. Your entry is perfect! Thanks. Oh, Il Falconeri, Cortona, Italy! Returning to Tuscany. My intoxicating obsession. In every sense of the word! Take my back, por favore! I’d love to take my wife to the Marine Room….I want to show her the great ocean view. I think I would love to try La Dolce Vita Ristorante as I love Italian food! I’m thinking the Marine Room, but honestly, it’s just a matter of what water view hits me at the time. I’ll bet some other comments here will set me straight. Love George’s at the Cove. The views, the food…amazing! I have to join the George’s at the Cove choir. I’ve never been, but have heard great things about it. Who doesn’t love great food with a view? I lived in the San Diego beach area for many years–since moving to Colorado, I miss at Rubios. There was also another wonderful restaurant that overlooked the cover that I loved to dine at just at sunset–can’t recall the name. the Marine Room is also a great experience! I think I would try nine-ten. Haven’t been to that one and the food is supposed to be great! A.R. Valentien looks wonderful. I really appreciate the Farm to Table concept. Those tacos from Karl Strauss look stellar! Marine Room @ high tide. I have to also say at George’s at the Cove. The view is spectacular! ! I like trying different sandwiches and the ones on the Goldfish Point Café menu look really good. I want to dine at The Crab Catcher:) This is an AMAZING giveaway. Thank you so much for hosting it. It would be delightful to go on a getaway since my boyfriend of 8 years and I have never been on a vacation, lol. We are just that busy! I would live to go up the Marine Room. You can’t beat the view and the food is superb!! If I come to La Jolla I would want to check out The Marine Room. I love seafood and that place looks amazing. George’s at the Cove. Great food and view. I have never been to this area………so no clue on where i’d want to eat the most…can’t i just say all of them???? I’d love to try George’s at the Cove. Truluck’s. I lived near it for 4 years during college but as a college student it was way out of my price range! I would like to dine at Karl Strauss Brewing since we are of German descent annd frequent German clubs and restaurants. We are always looking for a better beer and better sauerkraut! We’ve always enjoyed Eddie V’s – love the fried calamari, Asian style! Haven’t been to the Manhattan Room in years, but remember it being delicious! I would like to dine at THE MED at La Valencia Hotel since I have heard so much about it! Never having been to that area, I would love to try all of them as well. I think that I would pick Elizabeth’s brain and pallet and if I only had one to chose from, probably go with her expert advice. I Love Manhatten. Dirk is our favorite waiter. BTW the old guys from the Whaling Bar are there, so the Whaler Drinks are alive and well! A.R. Valentien because I have not yet been there. Truluck’s–I’ve been there many times, and they are CONSISTANTLY great–Food, service, venue and they have a great happy hour! I would go to Alfonso’s, even though it is getting a little run down at the heels, because it was one of the first places my husband and I got to know in La Jolla after we got married at the Hotel del Coronado and moved to San Diego. So many choices! We love places as diverse as George’s and Come On In; Nine Ten and Spice & Rice, Rappongi and Rebecca’s (at SRI). Our next big dinner date: Either Marine Room or A. R. Valentin. Can’t decide. George’s at the Cove because of food, view, ambiance & sentimental recollections. I’ve been DYING to try The Med at La V, fingers crossed it will happen soon! I love Mexican street food (I lived there for two years), so if I were in southern California, I would certainly need to have some! In that case, I would try Puesto Mexican Street Food. I have never been to the area & I woyuld love to eat at many wonderful spots but for certain I will eat at The Artisan Table at A. R. Valentien. Eddie V. – our friends from AZ who came to visit loved this restaurant and we did too. Any & all restaurants in La Jolla. Love Piatti’s especially in the fall for the squash ravioli.especially with a good friend. George’s at the Cove Ocean Terrace! When you reach the top step and look out at the ocean, you could be a thousand miles from home or in your own playground. It’s simple and sophisticated, delicious and delightful, and the vistas are to die for! I’m a sucker for some fabulous French Toast and Cody’s definitely delivers! I would love to explore La Jolla more with this giveaway! Cheers! Electric Karma / Beverly Hills. So many great choices but I’d go for Georges At the Cove for great food and awesome view. L’Atelier in St Cirq Lapopie, France. Awesome location and great french home cooking! Drawback: the menu does not change. Nonetheless, everything on it is delicious. An Osteria is typically a place where wine and simple food is served. Located in the Shores and just a short distance to the La Jolla shores boardwalk where you can take a short stroll after dinner. In Italy, this would be comparable to “la Passeggiatta” : a place where locals stroll at night after work or after dinner. I really don’t have “a favorite restaurant” unless a favorite restaurant is defined as a place frequented often, in which case, I would have to say Osteria Romantica! Allegro restaurant in the Four Seasons Prague Hotel. Costes in Budapest off Calvin Ter. The Marine Room in La Jolla is incredibly romantic, has amazing views of the surf and the food is some of the best I’ve enjoyed anywhere in my travels. And of course, for wicked fish tacos and fresh sustainably-sourced seafood, one must stop in at La Jolla’s El Pescador! My favourite restaurant in the world is Sushi Zanmai, a tiny closet-sized sushi joint only a few stumbling blocks away from the world-famous Tsukiji Fish Market in Tokyo. I love to get up at the crack of dawn to go to the market, where I gape over the enormous tuna sold on auction and dodge shouting people on forklifts past crates of seafood. Then after I’ve worked up a considerable appetite, I stand in a long line for a delicious sushi breakfast, downed piece by piece at the counter. My favorite restaurant in the world is a small pizzeria in Paris. It is a block away from the Louvre called Pizza Oskian. Tastes like Italy. The Blossoming Lotus in Kapa’a, Kaua’i – gourmet organic vegan! I love George’s and The Marine Room! Why choose when you are in La Jolla, you can have both!!!! Brockton Villa – outstanding breakfast and great view! I love Gramercy Tavern in New York City! Amazing food! Love nine-ten and Tapenade. Would like to try George’s, on someone else’s expense account! My choice for dining anywhere in La Jolla would be The Artisan Table after reading all the suggestions, reviews, tweets and great testimonials. I have say George’s on the Cove, it’s just sooooo good. La Jolla is a great destination for shopping, relaxing, and casual and fine dining. I love strolling through fun, unique boutiques. Everyone is always so friendly and I find the coolest stuff. I like to stroll along clean beaches, watch the sun set and finish off the day with a to die for view at one of several excellent restaurants, Georges at the Cove being a definite favorite! The Hotel Shangri-la Santa Monica Dining Room overlooks the Pacific and the seasonally varied cuisine with locally sourced produce from the Farmer’s market is always a treat. Since I have 5 Georges in my family, I have to say George’s At The Cove. Victoria & Albert’s restaurant in Disney’s Grand Floridian Resort & Spa at Walt Disney World Resort is expensive but worth the price. They always have unusual meats and a very attentive staff with impeccable service. Wine pairing is available. My favorite La Jolla restaurant is the patio at Georges, but my absolute favorite restaurant is Michael Mina in SF. The MED at LA VALENCIA! I have never been to La Jolla, so I would like to try out as many restaurants as I can. I absolutely love The Marine Room. Chefs Bernard and Ron are fabulous! In La Jolla….I would love to experience High Tide at the Marine Room and/or the Tasting Table at AR Valentien! Everything tastes delicious here! Just ask Guy Fieri of “Diners, Drive-Ins, and Dives”. We visited San Diego last year. Cannot wait to go back! We wanted to dine at the Marine Room while there, but we did not get the chance. Seems like such a beautiful dining experience! I love breakfast at Coffee Cup! For dinner…Karl Strauss Brewing or George’s at the Cove. An evening of dining which I will always cherish was in Bagan, Myanmar, a place known for more than 2,000 pagodas. The highlight of my al fresco dinner at Xanadu’s, a restaurant at the Aureum Palace Hotel, was the background of hundreds of lit pagodas. Making the evening even more special is that we wore traditional Burmese attire. Tanta/Chicago. But I would love to have a new favorite, preferably with an ocean view. George’s is the place I take visitors but right now I am loving Iberico, the new Spanish/tapas restaurant! Living in Encinitas, I’d have to say my favorite restaurant right now – anywhere – would be Bull Taco in the Cardiff State Beach campground. Cliff-top views of the coast, sitting out in the open, eating Bull Taco’s famous “inauthentic Mexican” food. They even have evening music during the summer. Marine Room, but specifically on Sunday, high tide brunch with my bride. I have to say that the La Valencia Sunday Brunch is so rellaxing and spectacular that it’s just about my favorite. The variety is amazing and quality is superb. When I was a young reporter, we hung out at Jose’s but that was more about the company that the cuisine! If I could dine anywhere at La Jolla I would go to George’s at the Cove. If you’re a foodie and you have never experienced George’s at the Cove, you MUST try it! They offer the perfect combination of spectacular food and great ambience. Favorite restaurant anywhere in the world would be a tiny gelato place down an alley in Siena, Italy. The most bold flavors I have ever tasted. My all-time favorite restaurant is the Zuni Cafe in San Francisco, CA. My favorite restaurant in the world? That’s a tough one, but one favorite at the moment is the Butterfield Room at La Casa del Zorro in Borrego Springs. Chef Kurt Hauser has done wonders there with the food, and the ambience of that classic desert resort is magnificent. I would love to try brunch at the Whisknladle!!! I’d be delighted to eat at any of the restaurants mentioned in the contest. If I had to pick one probably the Artisan Table at Torrey Pines. As a golfer, the history of Torrey Pines is so compelling. If I could dine anywhere in La Jolla, it would be Herringbone. The relaxed, earthy atmosphere is a perfect gathering place for those who either like to meet friends after work or for those who are looking for a romantic evening one-on-one. It has the right amount of class along with its whimsical atmosphere — it’s perfect for a wide variety of tastes! My favorite restaurant in San Diego Eddie V’s in La Jolla! Sparklin Hill Resort, a European Wellness Model in a Canadian environment with millions of Swarovsky chrysalis used throughout the resort, excellent themed sauna’s and the only Cold Sauna (-110 celcius) in North America. I would have to say my favorite restaurant in La Jolla is George’s on the patio at sunset! My favorite restaurant is Eddie V’s. I’d love to eat at NINE-TEN restaurant in La Jolla. We stayed at the Grande Colonial Hotel on our last visit and loved it, but didn’t get chance to eat in their restaurant. Thanks for the chance! My current favorite restaurant is Blue Water Grill / Ambergris Caye, Belize. Maybe that will change when I get to La Jolla! I enjoy dining at Herringbone in La Jolla. Outside of that, I love “The Restaurant” at The Dolder Grand in Zurich Switzerland. It’s been over 30 years since I’ve been to La Jolla so I guess I would have to choose the Artisan Table as my “expected” favorite. If I could dine anywhere, it would be Bien Shur in Albuquerque. Was in Carlsbad last December and very impressed with the culinary scene. With fingers crossed, hoping to check out La Jolla. Dinner by Heston Blumenthal, London – Where else can you dine on thoughtfully created cuisine from 1500’s to 20th century? I have never been to La Jolla, so I would love to eat anywhere, and I dont have a favorite restaurant. My favorite place to dine in La Jolla is probably PrepKitchen or WhisknLadle (same owners). Great food, affordable, and lovely atmosphere. What a wonderful giveaway, Elizabeth! Thanks for taking the time to put it together. Anyway, in answer to your second question – “What is your favorite restaurant (anywhere in the world)?” – I’d have to say that, beyond many options in New Orleans (my hometown and a definite foodie’s paradise), my favorite restaurant is Pierre’s Restaurant in Islamorada, Florida. In addition to serving delicious, creative seafood, Pierre’s offers impeccable service, a laid-back Florida Keys atmosphere, and a terrific location on the beach. My husband and I find it extremely romantic, especially if you opt for a table on the rear balcony, overlooking the tiki torches along the sand. George’s at the Cove for sure!!! The Marine Room has been recommended to me. One of my favorite restaurants is Tarantino’s in San Francisco. El Pescador Fish Market in La Jolla is definitely a stop to make next time in the area. I love to eat at Vapiano in downtown Charlotte NC whenever I’m in town. Good Italian food, wonderful contemporary decor and a unique way of serving. You get a “charge card” from the hostess and you use it at the various “stations” to purchase a la carte what you want and then you settle up with the hostess when you leave. I would say The Artisan Table experience at A. R. Valentien! I would consider myself a newbie foodie–at the ripe ol’ age of 26 I have just begun to experience the world of cuisine. My husband is in the Navy and this has brought us to our current duty station located just outside of Seattle. Our very favorite restaurant to dine at would be The Walrus and The Carpenter–several big write-ups including the NYT put a stamp of approval on this amazing place. It’s our special occasion restaurant although we tend to make excuses for a visit. Would LOVE the chance to explore La Jolla while stationed on the West Coast! My favorite restaurant is Maggiano’s Little Italy in Dallas. There is NOTHING on their menu that I’ve tried that I didn’t like! The service is excellent. The atmosphere is genuinely Italian and the food is outstanding! I would love to go eat at the Manhatten of La Jolla Italian Cuisine!! My mother and stepfather went for their 15th Anniversary and had an amazing time, I couldn’t stop asking her about it. It looks and sound so magical! I would love to propose to my husband in a beautiful place like he did for me 5 years ago!!!!! I’d like to dine in The Lodge At Torrey Pines, particularly after a round on the South Course. I would love to dine at George’s at the Cove! I’ve never been to La Jolla and this sounds wonderful! What a fun contest and everyone’s answers make me hungry looking places up! Would love to try George’s at the Cove! My favorite restaurant is Trattoria Der Pallaro in Rome. I have never been to the area but the Artisan Table sounds amazing. I love Rubio’s fish tacos, so I’d eat at Rubio’s! LaJola. Love Eddie Vs. Go at sunset and request coroner window. The vistas are lovely. Service is great! My favorite restaurant in the world is Lulou’s in downtown Reno, Nevada! Tried George’s at The Cove for the first time last year. Yum! I also really like The Dead Fish in Crockett, CA and the Portland City Grill in Prtland, OR. I like my meal with a great view! If I could dine anywhere in La Jolla, it would be at Truluck’s. It is one of my favorite restaurants, anywhere! I love Cheese Cake Factory. Please pick me and expand my culinary experience! I would LOVE to experience THE MED! Tapenade or Lodge at Torrey Pines in La Jolla; best of all: The Herb Farm outside of Seattle. Victoria’s in Green Bay, WI has the best gnocchi I’ve ever had. La Valencia Hotel Sky Room: outstanding view & service. I’m also going to say George’s at the Cove. Never been there but I’m a sucker for the a gorgeous ocean view! I also would like to try Mandarin House. the combination of La jolla and cooking is exquisite! My favorite restaurant anywhere in the world is Aldo’s in San Antonio. BEST Chicken Marsala ever!! Chandler’s, although a local favorite is a foodies haven. I think I’ll pick the Artisan Table! Acqua Al 2 in Florence but I love their sister in San Diego, too! My wife and I would dine at El Pescador Fish Market. It is casual and relaxed place to grab great fresh fish tacos. We love taking the food to go and having a picnic on the beach together. There isn’t a better place for fresh fish! I cannot choose between Rubio’s for a pesky combo or Rimel’s for the chicken! too hard – they are both delicious! Karl Strauss sounds like my kind of place…would love to try it! I’d like to try the French toast at the Brockton Villa in La Jolla! My favourite restaurant is Leutschenhaus, in Freienbach, Switzerland. Sadly, it has closed down now but they will be opening in another TBC location soon! There are so many! My recent favorite is Zuzu in Napa, CA. Everything was made fabulously beautiful and delicious, and the atmosphere was fun, earthy, and trendy. For a Chinese American who has been spoiled by all kinds of great Chinese food all my life, this is one of few Western restaurants that was able to win my heart! Hunan Mao in Rosemead, CA. Authentic Chinese Southwestern SPICY food. favorite restaurant: Sooke Harbour House, Vancouver Island, B.C. The food, view, art & wine. My favourite restaurant is Kingyo in Vancouver my hometown. This trip sounds amazing. I am a food writer and would die to cover some of this stuff! In La Jolla, I’ve got to go with George’s at the Cove. My favorite is Mi Tierra’s, San Antonio, Texas. Thanks. I would love the opportunity to experience luxury and fine dining in La Jolla. As a travel photographer and video host, I would definitely bring my other blogger friend with me to experience a little luxury, and create some great content, about La Jolla! Living just north of Toronto,Canada,I don’t get to the Pacific Ocean very often. 30+ years ago, while visiting my Great Aunt in La Jolla she took me to the Marine Room for a magnificent and memorable experience. The fabulous food! The View! I will also remember how she made me feel that night.Very fond thoughts of the Marine Room indeed. My favorite restaurant in La Jolla is probably Eddie V’s. For the views I would pick The Marine Room. Favorite restaurant ever was this place in Edinburgh called The Grain Store. It was so good! The Marine Room – at high tide, during a winter storm. Tough question! I LOVE dining in La Jolla! If pressed – is have to say Marine Room is my fave! I don’t want to be obvious but George’s At The Cove is always a great place! What a fabulous giveaway, Elizabeth! My two LJ favorites are the Marine Room and A.R. Valentien. My mouth is watering just thinking of them! For those who like their places a little more authentic than A.R. Valentien, I recommend Bull Taco, the tiny but delicious taco stand that is inside the State campground in Cardiff and has one of the best views of any “restaurant” in San Diego country. Their patio hangs over the beach and looks all the way to La Jolla. I would love the communal eating setting of the Artisan Table! Whisknladle in La Jolla! I have never been but I would love to go! I love Sa Wad Dee Thai in Meridian, Idaho!! My Favorite restaurant to go to at any time of the year in La Jolla is Georges at The Cove. Not only for the amazing choices in food…….the view and ambiance is top notch! one’s of my favorites is Marine Room Restaurant in the Shores!! Never been, but desperately would love to go!! All restaurants look amazing, would love to try Marine or Georges at the Cove? Thank you! What is your favorite restaurant (anywhere in the world)? My absolutely most favorite restaurant in is located in Rome, Italia by the name of “La Campana,” and has been around since 1518. Their service, quality of ingredients, taste of food and overall experience is second to none. LeSud in Lyon, but there are many worldwide. Favorite place anywhere in the world? Blue Moon Cafe, Manteo, North Carolina. Fantastic seafood creations and an overall ambiance to the business, the downtown district and the town as a whole that I just love. What an amazing opportunity! I have only been to La Jolla Shores once, and absolutely fell in love with it! I attended a Balloon release on October 15, 2012 A Day of Remembrance in honor of all babies that are gone too soon. This has become a very special place to my husband and myself. We lost a baby in 2012. It would be amazing to win this! My favorite place to Dine is Taps Brewery in Brea Ca. We love the atmosphere and love the food. Thanks you for this opportunity to win an amazing Getaway!! Bambuddha Grove Ibiza – exquisite far eastern meets Mediterranean fusion cuisine. Perfect every time! La Ribaudière – a 1 star Michelin restaurant in Bourg Charente – France – not far from Cognac. Excellent food at a reasonable price considering the quality. Modern atmosphere next to the Charente river. My favorite La Jolla restaurant Is George’s At The Cove. I would dine at George’s At The Cove in La Jolla, CA. If I could dine anywhere in the world, I would dine at French Laundry. I love the food at Roppongi/La Jolla! Rappongi is my favorite restaurant in La Jolla. Wonderful happy hour, delicious variety of smaller portions available, the food always fresh, creatively prepared and beautifully presented. Location is great oo! My favorite restaurant is a small restaurant near Traverse City called The Boathouse. I’ve never been to La Jolla but would love to go! Blue City Cafe in Memphis. The ribs were ridiculously good. My favorite restaurant is Winston’s in Toronto.